Source: Produced in E. coli. Mouse Dkk-1 is fused at the N-terminus to a His-tag. Formulation: Liquid. In 50mM TRIS, pH 8.5, containing 250mM sodium chloride, 2mM DTT, and 1mM EDTA. Scientific Background: Dkk-1 (Dickkopf or Dickkopf-1) is a secreted inhibitor of the Wnt/canonical signaling pathway which mediates a variety of cellular processes. Wnt proteins are extracellular signaling molecules that initiate activation of the canonical pathway by binding low-density lipoprotein receptor-related protein 5&6 (LRP5/6) coreceptors, triggering a cascade of events that stabilize β-catenin. Wnts mediate osteoblast development and cell-to-cell interactions during embryogenesis, and are also responsible for regulating bone mass in adults during normal bone remodeling processes. Wnts are also found to be expressed during the stationary phase of the cell cycle and are thought to control expansion of bone marrow stromal cells preventing overpopulation in marrow. There are at least two families of secreted inhibitors of Wnt signaling: the secreted frizzled-related protein family and the Dickkopf family. 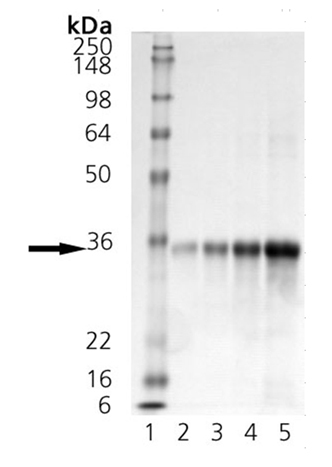 The mouse Dkk-1 protein consists of 272 amino acids including a 31 amino acid N-terminal signal peptide. 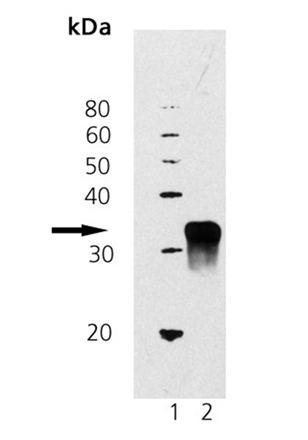 Mature native Dkk-1 has a predicted molecular weight of 26kD and an apparent molecular weight of approximately 38-42kD by SDS-PAGE and western blot analysis. Dkk-1 disrupts the canonical pathway by binding to the LRP5/6 coreceptors, preventing interaction with Wnt and facilitating degradation of β-catenin, which ultimately results in osteolytic breakdown of bone tissue. Wnt signaling dysregulation has been implicated in cancer of the colon and stomach. Gonzalez-Sancho reported that the Wnt/β-catenin pathway is downregulated by the induction of Dkk-1 expression, a mechanism that is lost in colon cancer, suggesting that Dkk-1 acts as a tumor suppressor gene in this cancer type. Dkk-1 proteins are expressed during log phase of the cell cycle, suggesting that dysregulated Dkk-1 could be responsible for the growth of some malignancies. The Dkk-1 gene has also been determined to be a target of p53, as Cappuccio suggests it is a necessary requirement for the execution of cell death. Tian reports that elevated Dkk-1 levels in bone marrow, plasma and peripheral blood from patients with multiple myeloma correlated with the gene-expression patterns of Dkk-1, and were associated with the presence of focal bone lesions. A study reported serum levels of Dkk-1 in patients with multiple myeloma before autologous stem cell transplantation. The range of Dkk-1 serum levels in this group of patients was 6.4-234.8 ng/mL with a mean of 63.6 ng/mL and a standard deviation of 77.3. Hall et al. suggest that Dkk-1 may act like a switch on prostate cancer cell activity, causing cells to change from osetoblastic to a highly osteolytic cell line.